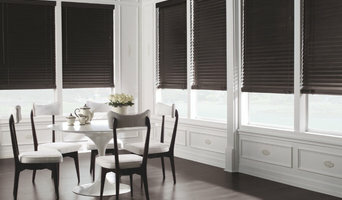 Blinds.com is the #1 online provider of blinds, shades, shutters and draperies in the United States and Canada. We are your source for all things window treatments, and your interior decorating aspirations. Can we help you? Our team is ready to roll up our sleeves with your window design projects 7 days a week. Rockwood specializes in interior window shutters, blinds, shades and decorative sliding barn doors. The very best of traditional craftsmanship is seamlessly integrated with the latest technology and engineering innovation in the state-of-the-art Texas manufacturing facility. Every order received is custom manufactured to the exact dimensions and characteristics in accordance with the design specifications. The largest interior shutter provider for The Home Depot, Rockwood serves over 735 store locations. Rockwood is relentless about providing quality products with features that are unique in the industry. Complimentary in-home design consultation and professional installation are always included. Headquartered in Houston, Texas, a city known for its strength and resilience, Rockwood continues to maintain its commitment to American craftsmanship. Rockwood believes quality should never be compromised, and to this day, every product is custom-made in Texas by manufacturing specialists. Rockwood products are proudly Made in the USA. Rockwood is involved in several philanthropic programs throughout the community. The company supports the Habitat for Humanity, and in addition to donations and hours of volunteered efforts, gives all shutters or blinds that are made to the wrong specifications to a Habitat for Humanity Re-Store. In 2017, Rockwood purchased 25 bicycles and organized a team building activity for the Sales Team to assemble them, and later donated them to Together We Rise, a 501(c)3 organization benefiting children in the foster care system. Jennifer Baur serves on the National Board of Directors for Lemonade Day, is a Silver Sponsor for The Home Depot Foundation benefiting wounded Veterans, as well as a Habitat for Humanity Volunteer working with The Home Depot Foundation on projects benefiting America’s Veterans. Window Covering Designer, Light Interior Design, Kitchen and Bath re-does. At Shades, Drapes & More, our extensive range of products & services are supported by our in-house dedicated work room staffed by a team of experts with over 60 years of experience. From inspiration to installation, SK Designs' award winning custom window treatments and bedding services include design/style ideas, fabrics, trims, renderings, hardware, and installation. From simple to sublime, we can help homeowners with projects from small to large, from basic to embellished, from one window to a complete home. Let us bring our creativity to you! SK Designs began in 1995, when I began working with homeowners in the greater Houston area. My first client from 1995 is still a client today! I have attended and taught at numerous trade conferences, seminars and classes, which has broadened my expertise and knowledge of designing and fabricating treatments, and also increased the variety of sources available for my client projects (fabric, drapery hardware, trims, custom fabricators for specialty hardware, as well as blinds, shutters, shades, etc.) I love working with homeowners during all stages of the project: from selecting fabrics and treatment styles and designs, to fabricating those treatments, to seeing the delight and satisfaction of my clients when the projects are installed. Let us help further beautify YOUR home! The Shady Lady Window Coverings provides custom design, sales, and installation services of window treatments and soft furnishings to the Houston Metroplex. Best of Houzz 2018 Winner. Jann Wisdom is a full service interior designer, specializing in high-end interiors and new home specifications, with typical home prices ranging from $250,000 to $5 million. Jann has over 25 years of experience in the design industry. She has worked on projects in the glamorous mansions of Beverly Hills to the breezy beach houses of Tampa Bay to the quaint colonials of New England and everywhere in between. Her vast experience as an interior designer and her first hand knowledge of design trends throughout the country set the stage for a keen sense of style that fits the personality of the home and the homeowner just perfectly. While many interior designers tend to have a very recognizable style, Jann prides herself on her ability to enhance each client's unique style. She invests her personal attention into every aspect of a project to create an interior that reflects her clients' individuality, tastes, and lifestyles. From ultra contemporary to European elegance, and anything else you might imagine, this savvy designer can create a look custom made for you. The Houston Shutter Center brings classic good looks and natural beauty to every décor. Hand made from solid basswood, a furniture-grade hardwood that outlasts most wood shutters. The Houston Shutter Center Wood Shutters are built for durability and are available in a variety wood stains and numerous shades of white. All shutters are locally handcrafted in Houston Texas adding timeless architectural beauty to your home. We are all about service and pride ourselves on providing a truly exceptional service for all of our customers. Give us a call for your in house consultation! Our team has been taking care of local customers for years. From favorite indoor shutters to stylish blinds, shades, and beyond, Sunburst is your partner in selecting the perfect window treatments! Memorial/Galleria Area - 9930 Katy Freeway Houston, TX 77055 (713) 984-1122 Richmond/Sugar Land/Katy - 5614 W Grand Parkway Richmond, TX 77406 (281) 232-3314 South East Area - 19072 Gulf Freeway Friendswood, TX 77546 (281) 486-8282 Kirby/West University - 5808 Kirby Drive Houston, TX 77005 (713) 667-5200 ABOUT US Family owned and operated. Established in 1976 by Steve Palmer, Creative Blinds has been in continuous operation since 1976. Committed to Customer Service. Our commitment to maintaining the strongest customer service team in the industry was a leading factor in our continued growth over the years. From that single store 38 years ago to the multiple design centers that are Creative Blinds today, that commitment is as strong today as it was over thirty years ago. Take The Tour. All Creative Blinds Design Centers have the latest window coverings on display in fully functional modules for you to see, touch and operate. Perhaps this is a starter home and the first time you have ever purchased window coverings. Perhaps your remodeling and its been years since you purchased window coverings. Whatever the case, you owe it to yourself to see the latest and greatest the window covering industry has to offer. In our experience an educated consumer is a happy consumer. My design philosophy is to focus on reflecting a client's personality and style. I believe window treatments finish a room by adding warmth, color, texture and pattern. As a multiple award winner for Custom Designed Window Treatments for Smith + Noble, I know custom window treatments will transform and complete your home. I focus on listening to my clients needs and wants to infuse them into a cohesive design. I have a passion for design, attention to detail, and extraordinary professionalism. I enjoy assisting my clients in realizing their vision! To the trade drapery workroom. 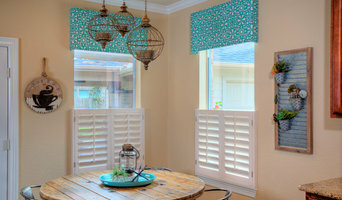 We specialize in plantation shutters in Houston and surrounding areas. Our shutters are true custom, actually milled from raw lumber to the finished product right here in Houston. If you're looking for high quality shutters with personal service, you've come to the right place. At Seth & Sloan, Inc. we’ll give you the attention and personal service you'll come to expect and enjoy. Welcome to Budget Blinds of Cypress, serving the Cypress, Tomball & Hockley Areas. David & Shana Hall look forward to providing solutions and ideas for all of your window fashion needs. David is an Engineer and Shana has a background in architecture. David is also a verteran having proudly served in the US Marine Corps. We are residents of the Cypress area for the past 20 years. Extensive domestic and international travelers, and avid boaters, we have now left “corporate America” to do something for ourselves and as a bonus we get to meet some amazing people in our customers and help them decorate their gorgeous homes. Our goal is simple: to provide you with the best products and services in order to enrich your home environment. Call us today to schedule your free in-home consultation. Gillian Wendel, owner of The Wendel Works, began her nationally recognized window fashions business in 1999. Serving clients in the greater Houston area, Gillian provides window fashion designs, complete bed ensembles, upholstery, binds, shutters and shades. With a fully stocked library of fabrics, trims and hardare The Wendel Works can create a one-of-a-kind look that embodies the essence of the world of custom. A clients' decision to explore the custom drapery world should be rewarded with enthusiasm and a sense of excitement. "My goal is to provide clients with just that, a fun creative process that draws them into the adventure and, at the end, rewards them with a high quality treatment they can enjoy for years to come."